Libby Dibby has a great upcycle tutorial for Dollar Store candles. We love the idea of taking something that is already usable, but making it so that it fits our home and decor - or even fits a holiday, party or wedding theme! Check out their blog for more DIY! This one couldn't be more simple! We like instructions that are so easy they take up less than a paragraph. 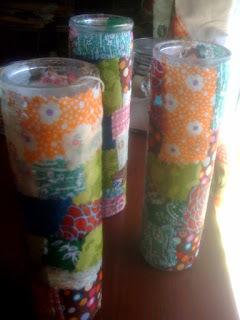 We took Dollar Store candles, the kind with saints on them... And used ModPodge to secure tiny fabric scraps to them... They look even better than I expected them.